The Rock Lock - handy new anti-theft device for the gigging musician. I’m sure many gigging musicians have a certain anxiety when it comes to leaving their guitars alone while out in public. There’s always that worry that you might come back and find your precious instrument missing. A new product has appeared that may hopefully reduce the chances of having your guitar go missing. 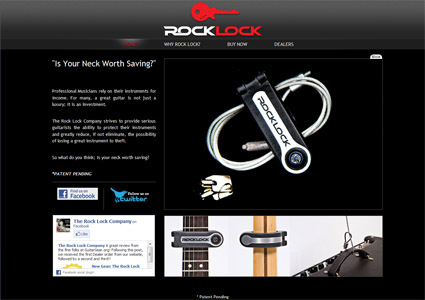 The Rock Lock is a new way of securing your guitar when out in public. You loop the cable around a secure fixed or heavy object, load the Rock Lock to the cable, and lock the Rock Lock around your guitar neck. This excludes: 12 String Instruments, Flamenco/Spanish Guitars, and Bass Guitars. It really is quite surprising that no one had come out with something as simple as the Rock Lock before. Musicians have had the worry of having their guitars stolen for decades, if not centuries! It all seems like a fantastic way to secure your valuable guitars, and at a price of $49.99 USD it looks to be a very cost-effective investment. The Rock Lock is available for pre-order now with free shipping too.